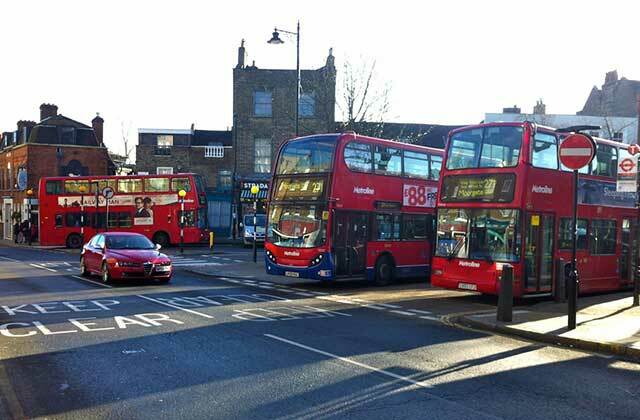 Another forum blog explains the logic behind the TfL proposal to change the 271 terminus location, which is being consulted on until 13 March. Here we just wanted to share some images that demonstrate the problems that can arise near the turnaround and cause irritation. The current location of the 271 terminus is an eyesore but it is also highly disruptive. Here are three examples. 1. Three buses at once. 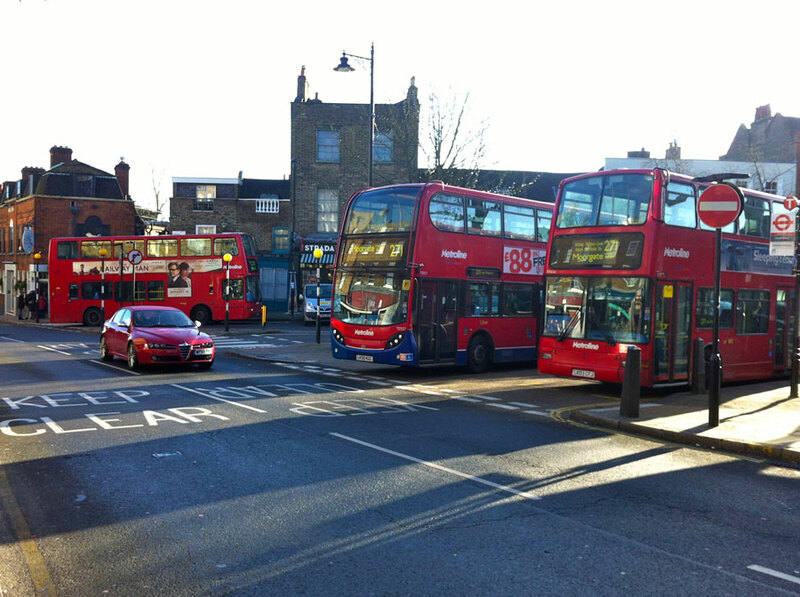 There are normally about a dozen buses on the route at any one time so it’s unusual to have three in Highgate together. But it happens and, of course, it causes chaos. The third bus just pulls over by Strada/Cafe Rouge and blocks the road for all users. 2. The breakdown. 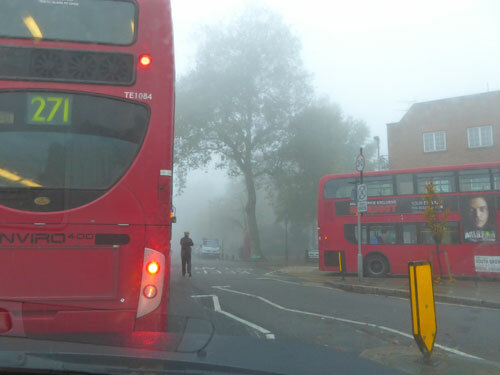 If there’s an issue with a bus or driver, the next bus is just blocked. There is nowhere for it to go. Queues grow behind it and down the High Street. 3. The dance. The buses are too large to swing into the space in one go, so they have to reverse in and out. This is dangerous to anyone crossing in front of or behind the bus and involves the bus pulling out into the High Street, stopping the traffic. If the driver has gone, for example to get lunch, the latest bus will just wait, blocking the road. Hopefully the consultation will be welcomed and these problems will cease to exist. I have no objection to the bus stop and buses at present and the three bus scenario depicted is not a regular occurrence. I am completely in favour of relocating the 271 bus terminus to North Road, but I have one minor query. My parents live at No.19 North Road, and there doesn’t seem to be any indication as to how they would get into and out of their driveway. Could you please advise exactly where the new mini roundabout would be located. Many thanks. So far as I am aware nothing of substance will change as a result of the work. The pavement will be a bit wider at that spot and the road a bit narrower, and the traffic would be expected to be slower. The roundabout will be a little to the north of that house. We will check with TfL (as could you) but I suspect detailed designs will be done if and when the scheme gets the go ahead. Thank you, I have now discovered where the new mini roundabout would be, and I would be very happy if the work went ahead, particularly if it were to make the traffic slower! I never even considered the bus stand to be a problem. The third bus scenario is silly because the riad is wide enough for cars to pass easily. Is this the Highgate Society in action again? A third bus doesn’t block the road. You can easily drive around it with a bit of care. Of course, this is unacceptable to the “very busy mums” and “pwoperdee developers” in their monstrous 4x4s, who terrorise the local roads. Face it, Highgate is beginning to fill up with self obsessed imbeciles. Can’t be too long before we get a reality show based in N6. What Highgate needs (along with all inner city areas) is proper enforcement of existing taffic regulations. As for recently introduced 20mph limits…..what a joke. Nobody obeyed the 30mph, what made anybody think drivers would adhere to a 20mph limit? 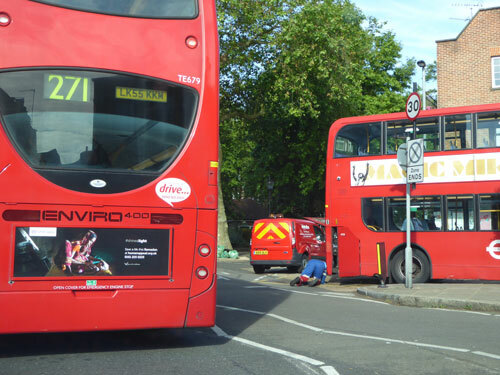 Has thought been given to the idea of terminating and turning round the 271 at Archway? The village is amply served by the 143 and 210 buses up the hill from Archway, and both these buses allow straightforward links Southbound from Highgate to all connections available at Archway. If the Problem is causing such division and discontent, remove the Problem….? Yes, is the short answer. Stopping 271s at Archway was one of perhaps 8-10 ideas that had been discussed. It was not welcomed by TfL as they expected it to lead to lots of what they call broken links. Too many disrupted and broken journeys. They do not want to cut routes when more people are using buses. Many in Highgate felt that stopping some 271s at Archway and running others to the Wellington for example could also be an option but that also did not meet with TfL approval. The village is mostly well served by buses but not in the morning and afternoon school run times when they are often full to capacity. It would be really nice to have more buses when we need them and fewer when they are nearly empty as they are at times during the day. But that too is a step too far for TfL at the moment. I am glad that hopefully the 271 bus stop will be moved further north. I am not happy though by the new proposals put forth by TFL to have an additional mini roundabout / U turn facility adjacent to Red Lion & Sun and petrol station. I fail to see why, when the road is wide enough, the 271 cannot travel further north to the Wellington petrol station or perhaps even to East Finchley where there is greater room. T`FL should remember that when the existing village centre bus stop was created the old Route Master bus was nearly a 1/3 smaller then the currant busses so their impact on the local area was less considerable then it is today.